I am no gourmet chef. I’m not really even close to being called a cook (although I do own some cute aprons in which I like to prance around my kitchen). Being beyond lazy, I almost always enjoy a nice bowl of cereal for supper. 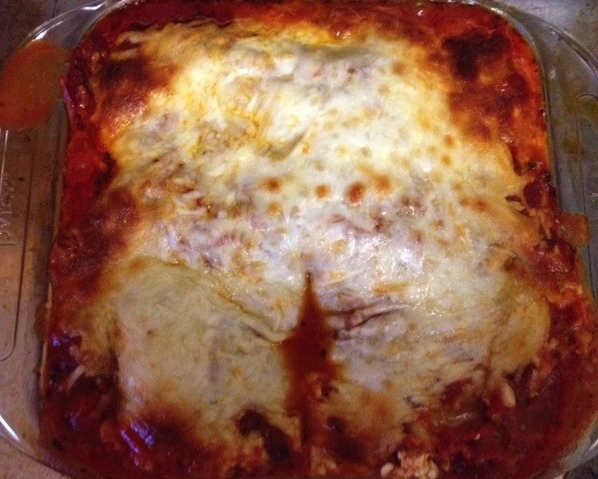 But every once in a while I get a hankering for ‘real’ food and one of my “specialties” is bland, non-exciting lasagna. Whipping it up for company not only makes me seem kinda domestic, it typically knocks the socks of my food companions, as I’m not offering them just wine and sliced cheese. Underwhelming cooking at its finest. 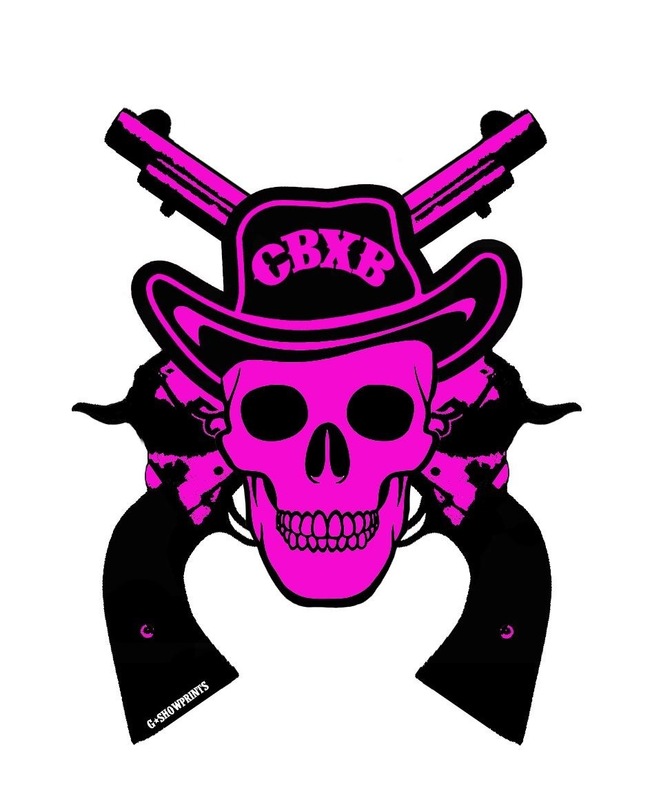 Although when presented on a skull and crossbones plate (which is my fine china), it really ups the ante, yes? 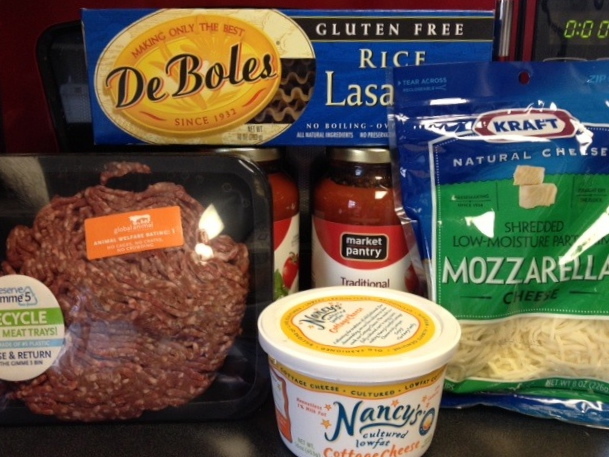 Gluten-free lasagna at its blandest. Preheat the oven to 350 degrees and then fry your choice of meat in a skillet. 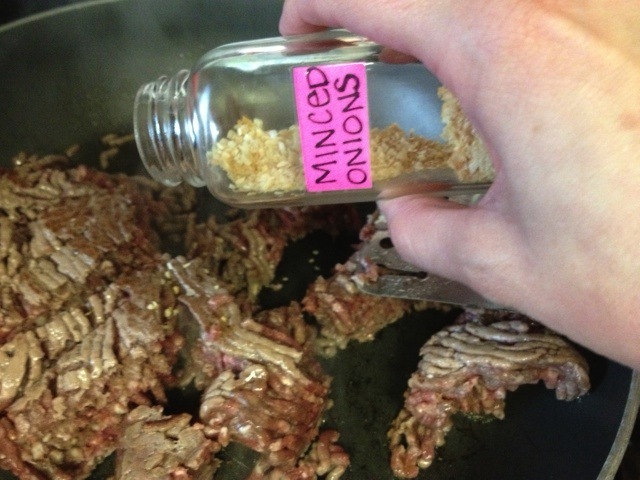 Instead of a slicing a fresh onion (takes too much time, makes my mascara run, etc…) I shake in some dried minced onion to spruce up the meat while it’s browning. You can also choose to add green peppers, mushroom, spinach, etc…but you know that takes more time, effort and money (plus adds flavors in which I don’t love…being from the Midwest, I’m all about bland food!). No need to cry in the kitchen with already minced onion. Once the meat is done grab a baking dish and coat with cooking spray. 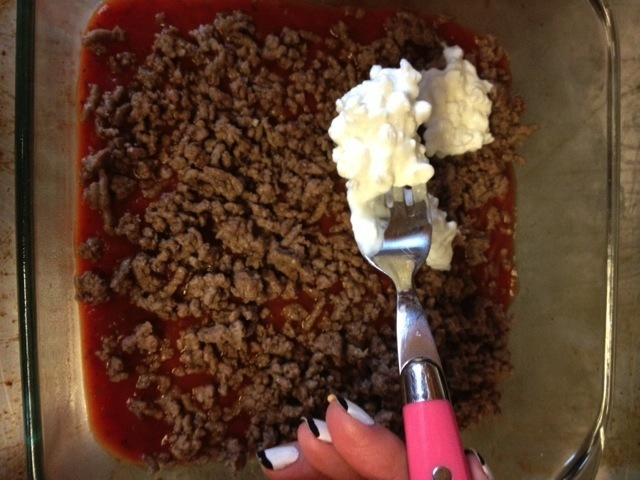 You’ll create three layers and start with the spaghetti sauce, meat, cottage cheese, noodles, sauce again and mozzarella. The second and third layers are the same as the first. 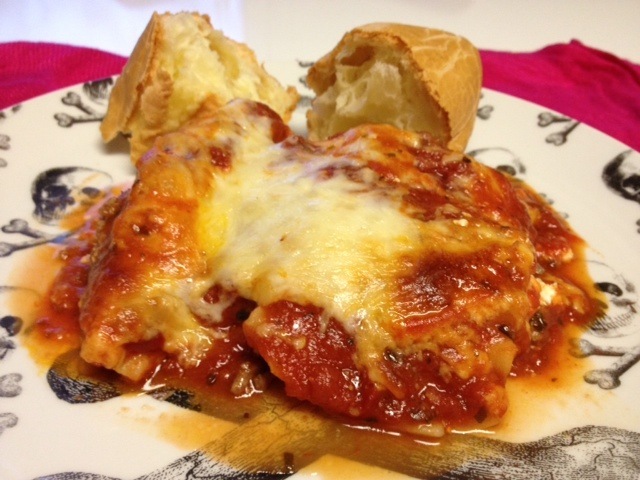 The “secret” weapon in my lazy lasagna is the using more sauce than needed. Leftovers are never dried out! Stick the concoction in the oven for 45 minutes. I typically cover in foil for about 25 minutes, then remove the remainder of the baking time so the top layer of cheese can brown. 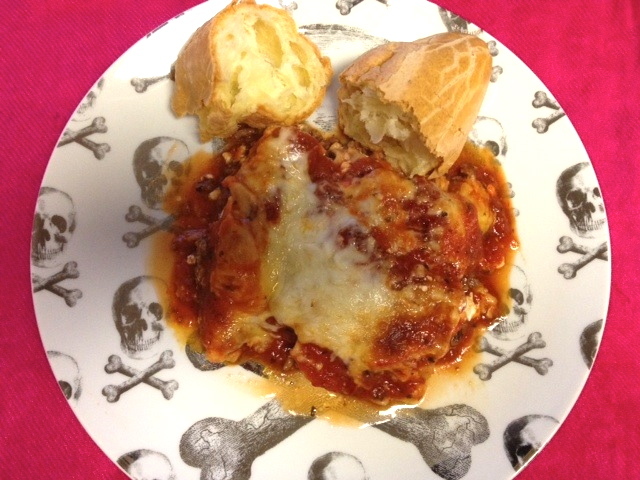 And what good is lasagna without bread accompanying its appearance on a plate? 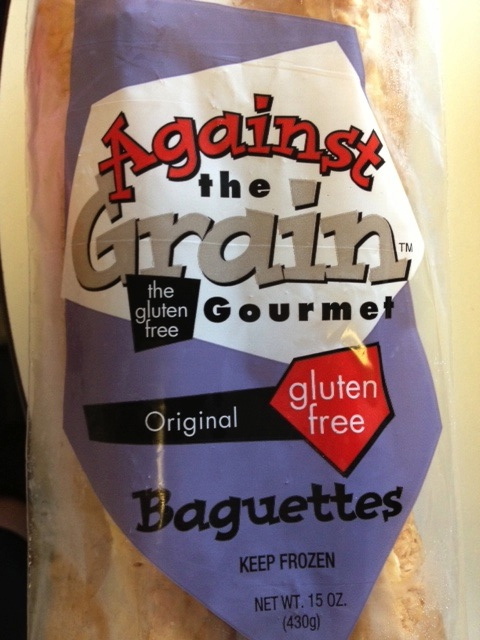 My favorite gluten-free baguette bread is Against the Grain. While it’s a little pricey ($7 for two loaves), it tastes as close to the real deal as any other brand I’ve tried. The splurge is worth it. 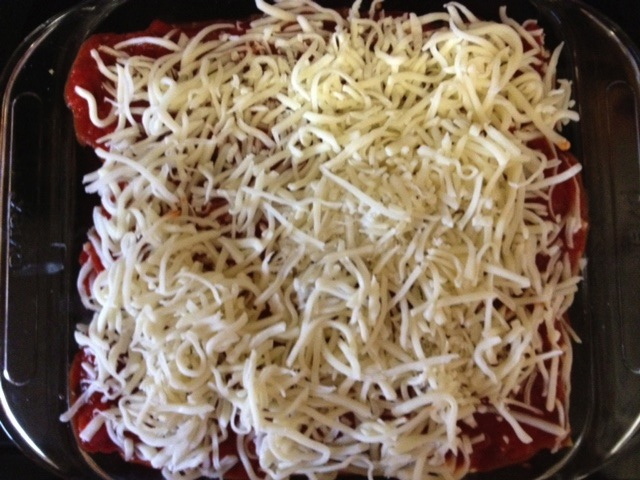 In about an hour, you’ll end up with a low-fat, gluten-free, bland, easy, company pleasing dish. Of course this lasagna is served with a very large bottle of wine. Duh. I never tell anyone this is gluten-free until after they’ve consumed and no one ever knows the difference! Bon appetite my lazy cooks!